The head of the North Atlantic Treaty Organization is expecting Canada to increase its presence on missions now that the Liberal government has promised to spend more on soldiers, ships and fighter jets. The head of the North Atlantic Treaty Organization says he is expecting Canada to increase its presence on missions now that the Liberal government has promised to spend more on soldiers, ships and fighter jets. 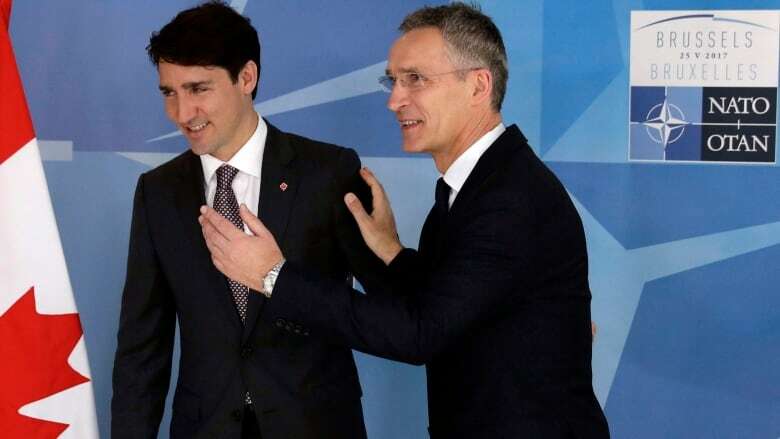 "We are not able to tell exactly today what kind of missions and operations we will have in five to 10 years, but now we need more Canadian presence in Europe," NATO Secretary General Jens Stoltenberg told Chris Hall, host of CBC Radio's The House. "There are already many different missions and operations where Canada is participating, but of course we hope that they can further strengthen their participation in NATO missions and operations." On Wednesday the Liberal government unveiled its long-awaited defence policy, which will increase the defence budget by 70 per cent over the next decade to $32.7 billion. The plan also pledges to buy 15 advanced warships and 88 new fighter jets. When asked if he expects Canada to make additional contributions going forward, including more rotations through NATO exercises, Stoltenberg said "absolutely." "We are building up our maritime presence both in the Atlantic but also in the Black Sea and other places, and we need those Canadian planes, for instance, for air policing ," he said. Gen. Jonathan Vance, chief of the defence staff, said decisions about individual NATO missions are made by the government, but the increased spending and bolstered fleet mean Canada can contribute more going forward. "Absolutely yes we will be able to do more in the future, not because we're altered dramatically in terms of our size, because we're not, but what we will have will be relevant to the future," he said. "Absent this investment, we may have the size but we would be irrelevant. "A lot of this is a commitment for NATO and other allies for the long term so that NATO has not only the qualitative but the quantitative predictable capacity of Canada in mind for the long term." Stoltenberg will travel to Europe with Defence Minister Harjit Sajjan later this month to greet Canadian troops in Latvia as part of a NATO operation to counter Russian aggression in Eastern Europe. "Our approach to Russia is based on a dual tract: defence and dialogue. Russia is our neighbour. Russia is here to stay. NATO doesn't want a new cold war, we don't want a new arms race." The Liberals' defence review followed on the heels of a speech Foreign Affairs Minister Chrystia Freeland delivered in the House of Commons on Tuesday, when she said Canada will step up to play a leadership role on the world stage as the U.S. turns inward. "The fact that our friend and ally has come to question the very worth of its mantle of global leadership puts into sharper focus the need for the rest of us to set our own clear and sovereign course," she said. Stoltenberg said disagreements are bound to arise between NATO's 29 member countries. "The strength of the alliance is that we have been able to overcome these kinds of differences again and again and unite around the core task of the alliance — that is, to protect and defend each other," he said. That principle has come into question after U.S. President Donald Trump didn't explicitly mention Article 5, the mutual aid clause, in a speech to NATO allies in Brussels last month. But Stoltenberg said Trump has made it clear to him that he's committed to the alliance. "There is no way that it's possible to be committed to NATO without being committed to collective defence," he said.